Thou Must Hate Thy Editor – My thoughts, precisely. Anyone who’s had a tiny bit of experience working as a journalist or just been associated with a media agency would know who the most strongly-felt-for person on the team is. Yes, you have the Boss, you have your chairman, you have various board members and senior writers, but who invites the collective fury? 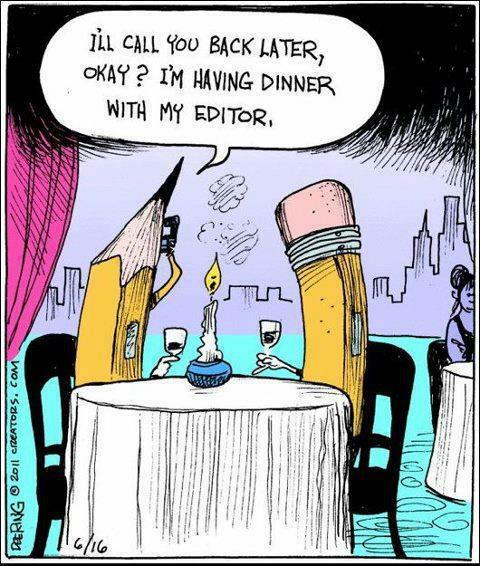 Yep, you guessed it right: the Editor. Now, what monstrous crime has this being committed, you may ask? What has he done to incur the wrath of all members, junior and senior? Well, the ridiculous part is, all he’s done is performed his duties well. A good Editor is respected, liked and looked upon as a mentor; a great Editor is all that, along with being abused and cursed under the breath by writers alike. Returned work, changed sentences, deleted paragraphs – just some of the things editing culminates in, leading to the person in question automatically becoming the Bad Guy; and through no fault of his, if I may add, except possibly a strong work ethic. Then you have the spurned writers, like artists who take all criticism of their work personally. They don’t seem to absorb the fact that, yes, the Editor returned/changed/scrapped your work, but the reason behind it may have been that it just wasn’t worth printing in its original state. The Editor does not have a personal grudge against writers, contrary to popular belief; all he does is ensure nothing below standard is sent into print on his watch, as he must. In the writers’ defence, it may be that the Ed is a horribly rigid person and believes only in a restricted form of writing, without accommodating individual writing styles. From their POV, they’ve just put in a lot of work to create a work of art, a reflection of their perseverance, and along comes the Editor to “deconstruct”. I admit there are occasions when I just don’t like the way the author has phrased a particular sentence even though it’s grammatically quite correct, leading me to furiously reorder the subjects and predicates and incorporate such changes that it looks/feels nothing like the original, just better(at least I seem to think so). I’m sure that’s enough to put off any self-respecting writer and I humbly apologise, though my Editor’s ego doesn’t allow me to be sorry(it’s a real thing, alright!). It is understood that nobody likes to be told off and criticism is a hard pill to swallow, but apart from the destructive kind, when has criticism harmed anyone? Being a professional in any field will involve being subjected to assessment every single moment of your career; it’s part and parcel of the whole game. And honestly, if Editor’s didn’t exist, imagine the utter mess that would be published(the horror!). My advice to proud, aspiring writers is to learn to be a big boy/girl and swallow your Ed’s condemnation; it’ll only drive you to improve your work. Also, as you have with all forms of authority, one cannot challenge, only question; unless one never wants to see another article in print. And we wouldn’t want that now, would we? Tagged author, books, boss, competition, criticism, editing, editor, editor's ego, ego, fued, growing up, grudge, guilty as charged, important, journalism, media, original, reading, rivalry, self-respect, tolerance, writer, writer vs editor, writingBookmark the permalink.